I am Mel, living in North Germany; I have been an AFOL for many years. 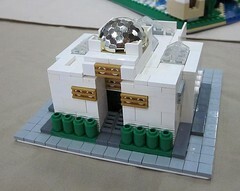 I love to build and collect LEGO and my favourite themes/things are town and related themes (train, monorail etc), promos, collecting coloured parts and wonderful LEGO accessories (food, special and rare parts etc) LEGO gear and attending events. I moved to Germany in Oct 2005 from Australia, I have been to many events and I am full of ideas and lots of excitement . My role as the correspondent/bureau for Europe is to write articles or find others to write articles for me/BJ in which I will pass on to Joe from BJ. It is important that any information regarding Europe and BJ comes through to me, so as to not double up on similar ideas or articles. It is not very professional when one person is asked twice by 2 people to do an article, therefore I require any ideas and information comes through to the bureau first. It is very exciting for Europe to be noticed in a large publication which has a great future ahead of it. So if there are any meetings, events, awesome builders, models, or stories to share and tell please pass them my way, of course all credit will be due to those who are involved. I do have a lot of ideas to put forward over the year, but would love to hear some from you too! I will attend a few of the events that will occur over the year, however I am not able to attend all, therefore this is where I need your help! Due to many different European languages, it is very hard to know what is happening within clubs and events in your areas, so please pass any details on to me. All information is welcome (just not spam, thanks ). Over time I will contact some of you personally depending on what theme or articles are required from BJ and me. My goal is to put Europe out in front as many things happen within Europe and many of us miss them, mainly also due to the language barrier and little media coverage and since we are aiming at an international audience, we want the world to see what wonderful things Europe has to offer! P.S. Since I may not be able to read your language, I am sorry if this post is in the wrong area. P.P.S. Any translators feel free to translate this into your national/mother tongue language/s. Many thanks! P.P.P.S. This posting is posted through-out European AFOL forums/clubs so some information may or may not be relevant to everyone. first of all welcome to Europe. I hope you like it and won't miss Down Under too much. I think I already met you in Berlin at the TSL. You were the poor one running around with the dragon costume and about 30 °C outside temperature, weren't you? It's great you want to push Europe and I think we all appreciate that. So you can be shure we will help you in any way we can. We will send you a list of our events 2007 as soon as we know the exact dates and if you need any other information, articles, etc. we will be happy to aid you. Thanks shary! HAHA! omg... yes... but shhh! How did you know? Did I get to meet you while I was in the Ollie costume? I am glad you appreciate me wanting to put Europe forward Many great things go unnoticed. Yes, please send me a list of your events, that helps to be better organized. I will post more information in the future and as time goes, for now I just want to introduce myself and hope some of you can help me! we (my husband Tom (ruckzuck) and I) were standing around with some guys (I think it was JürgenL, Jan Bayer and some others) when you came in wearing the costume. We were the two Austrians with Orthanc and Helms Deep and it was our first time so we didn't know most of the people there. But the few guys we knew were playing tourist guides for us *g* telling us some background information about all the others. And so they told us that poor Mel from Australia was sweating under the costume ;-). That's why I remember you. Wish you a good start at your job and a lot of responses and help! My son was a little concerned about having a dragon as a mother though "Mum, take your head off! where are you?"